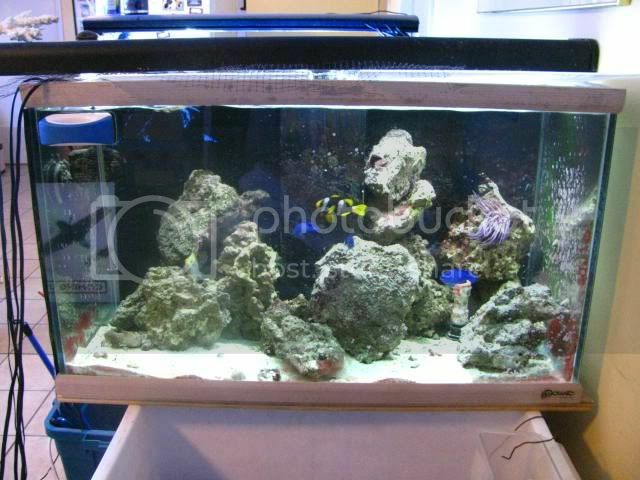 We want to start 2011 in a BIG way, so what better tank than Albano's (Alfie) 450G Katonah Reef!! Congrats on being our January 2011 TOTM Alfie!! We all know you are a car guy, but fish??? How did that happen? 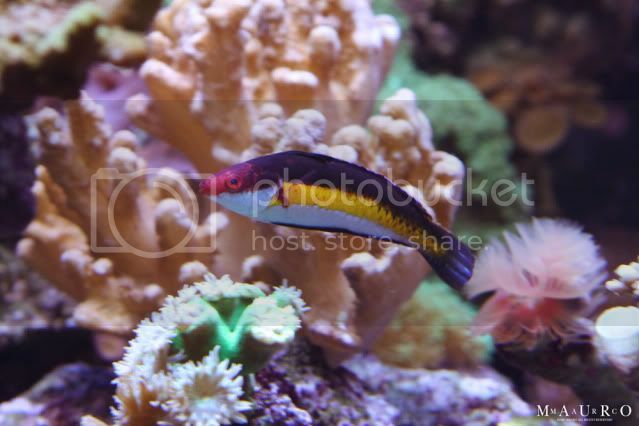 1986: George Smit writes a series of articles for FAMA magazine about wet-drys and Mini-Reefs and within months, I convert all of my home and office tanks to ‘mini reefs’, and soon become an advisor to 2 LFS’s, in an attempt to convert every SW tank in N. Westchester to a reef tank. 2007: after ‘hiding’ in the shadows I finally joined MR, so I could communicate with other ‘addicted’ reefers…. 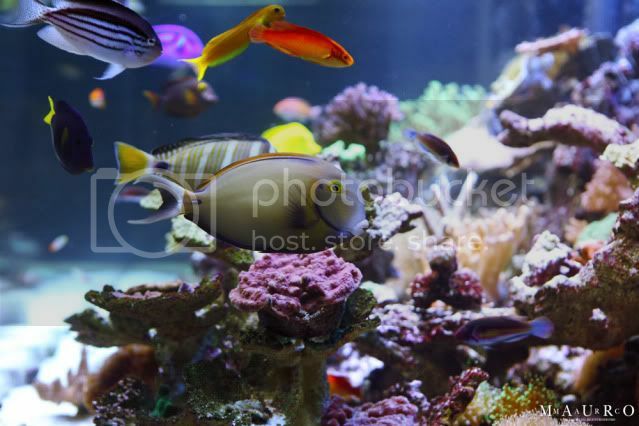 2011: Manhattan Reefs TOTM 1-1-11 … it took a while, but, I finally made it! Ok, now I see why cars & fish tanks are related in your world. Tell us more about the tank? 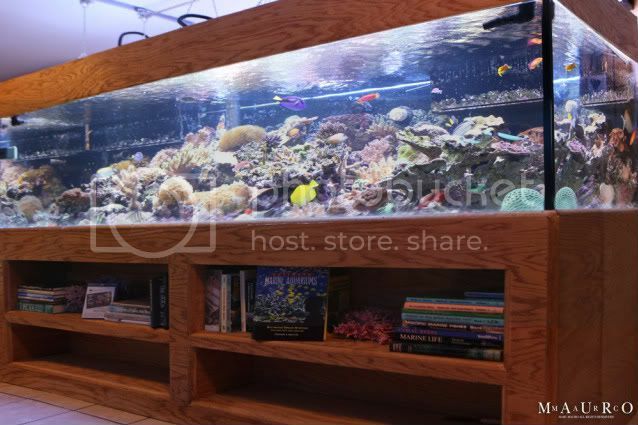 The 450g acrylic tank is custom built, by Glasscages, and is 96”L x 40”W x 27”H. I’ve had a lot of tanks, big and small, but my favorite was an 8’ 300g that I sold about 15 years ago so the tank had to be at least 8’ long and as wide as possible and the 96”X40” was the perfect size to sit in front of a living room wall. Unfortunately, plans change and the tank ended up downstairs, in the same spot the old 300g sat in! This tank, (which was sitting in the garage for almost 3 years and finally set up in June of 2010) is actually the combination of 4 other tanks -- totaling almost 600g -- that I had running, with my current 7 year old 200g sump. A good percentage of the livestock and equipment was acquired from MR vendors and Marketplace. 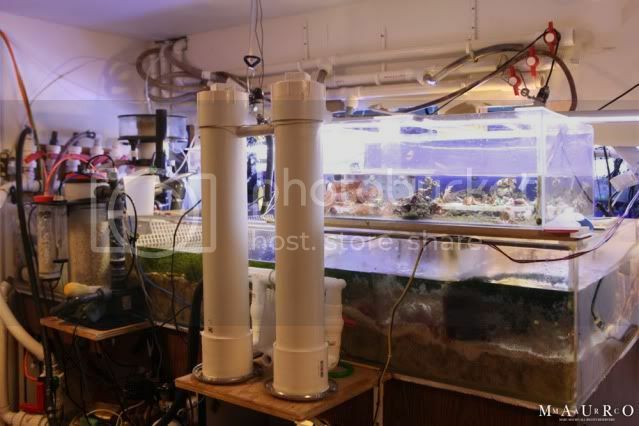 My acrylic sump (96”x34”x 15”h) was originally built as a lobster tank, I got it new from a custom tank builder, as a gift, when I purchased 2 other custom tanks from him. 2/3s of it has a 4” sand bed over a plenum, filled with Caulerpa, Cheato, and mangroves. There are millions of pods and micro stars (I did not actually count them), 2 or 3 cucumbers, and a couple large starfish. 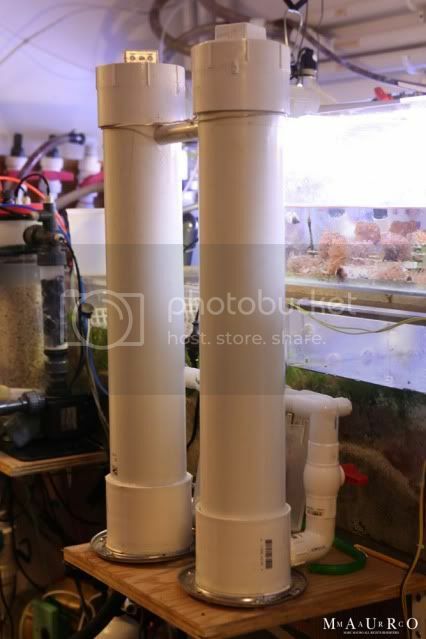 The third section holds the Euro Reef 500 recirculating skimmer. Water leaving the DT goes thru either of the 2 rear corner overflows thru filter socks into the sump, it returns to the DT by a Hammerhead Gold pump (5500gph) thru a manifold that feeds the skimmer, XXL dual reactor/chiller, a frag tank, 2 top/front corner sea swirls, and a 4 way Oceans Motion with 4 rear returns. Three MP40’s aid in circulation. The Hammerhead and heaters are on a circuit with my emergency generator. The Vortechs are on battery backup. I recently added a Vertex calcium reactor, to eliminate the 2 part dosing. What kind of lighting is on the tank? I was lucky to obtain two almost new 72” Solaris I5 LED units here on MR, and I also added ten 48” T5 HO bulbs, to cover the tank. 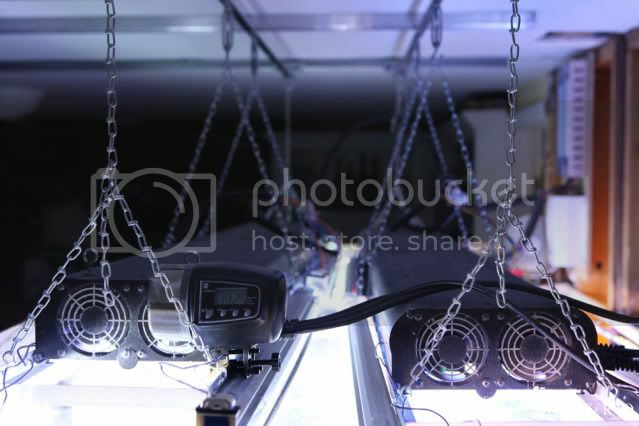 LED’s are still set at under 80%, and SPS is growing on the sand bed! LED’s are run on a solar schedule, and T5s are on for 3 hours in the evening, for my viewing pleasure. Not sure if you can really tell from the pictures, but the tank has a LOT of swim space. I had originally planned the ‘island’ look for the tank, but no matter what I tried, I didn’t like it. I ended up re-aquascaping the tank several times in the first week or two. I’ll admit to a rear ‘wall’ but it is not that wide, and with a 40” depth, it doesn’t bother me at all, plus the rock is not touching the rear wall so the fish can swim all eight foot from end to end and feel safe. Almost every base rock is drilled with 3 or 4 plexiglass ‘legs’, so that very little is actually sitting on the bottom. Everything about your tank is oversized, what are the water changes like? I usually change 30 gals a week for 3 weeks, and 120g once a month. I’m presently alternating weekly, between Reef Crystals and Oceanic Salts, but may try the ESV. The skimmer neck is cleaned 3-4 times a week, but skimmate (as well as emergency overflows) are plumbed directly to a floor drain and are not a concern. RO/top off - the tank evaporates over 4g a day in summer - goes thru a float switch to a 1g holding tank, and a constant ‘drip line’ into the sump. Should the float switch fail, the RO holding tank is also tied to the floor drain. Nice! I like the idea with the floor drains! How do you handle feeding so many fish? 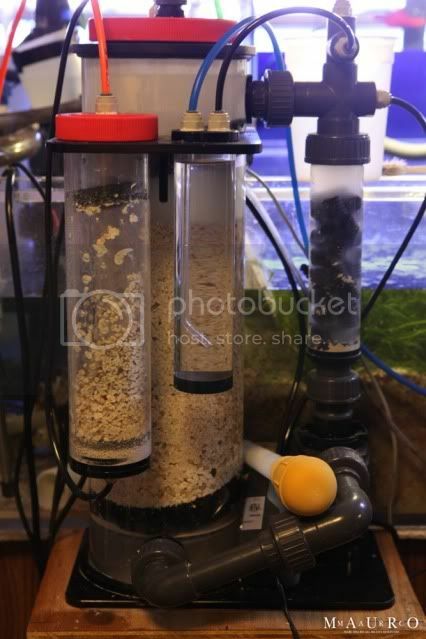 I have an auto feeder, that feeds a mixture of 5 pellets and 3 flake foods, twice a day at 10:00 AM and 3 PM delivering two portions each time to give all of the fish time to eat. I give them a garlic soaked mixture of frozen brine, mysis shrimp, and plankton, each night. 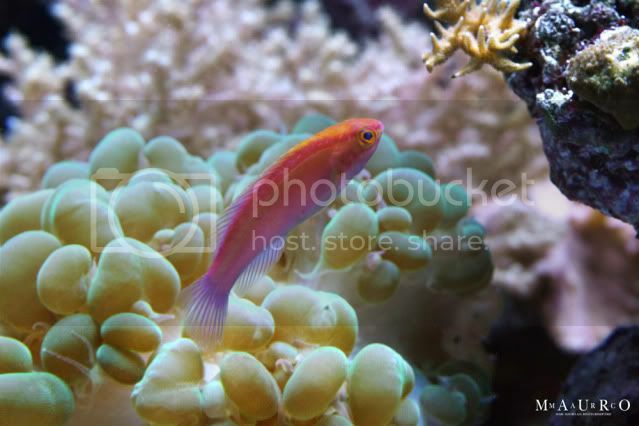 I also add food for the corals 2-3 times a week and a capful of Iodine daily. I don’t know how they tell time, but at 10 and 3, the fish are usually waiting under the auto feeder, just amazing. Due to the generous feedings I have to change the 3 filter socks every other day…YES 3 socks!! There are 2 from the tank overflows, and a 3rd one that filters the water before it goes into the Hammerhead return pump. Even after the first 2 socks, 15 sq. ft. of Caulerpa and sand, and the massive skimmer, that third sock has to be replaced every 2 days. Speaking of oversized...any close up pics of what are you hiding behind that tank? Ok, fess up, do you QT? I was never big on QT’ing new fish, but I realized that it would be near impossible to remove a problem fish from this tank, so all new fish go into QT. I set up a separate system with a 120g and 60g display tanks with a common 100g sump, filled with LR and Caulerpa. This setup has a ETSS skimmer and a UV sterilizer. Presently there are about 20 fish in QT, only a few are going into the 450, the rest have to be traded off. 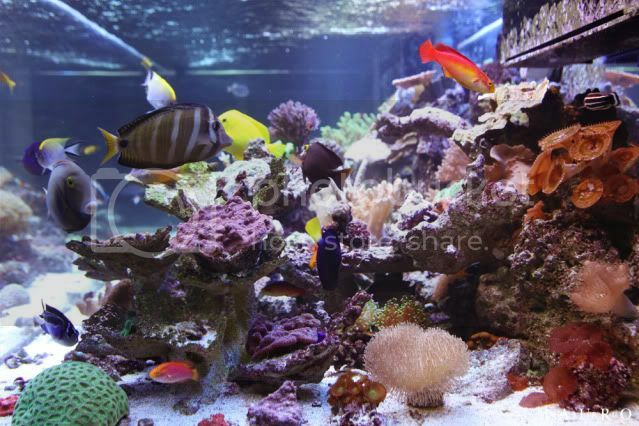 The tank also contains 20-30 pieces of coral that did not make the cut for the main tank, and will also have to be traded off. 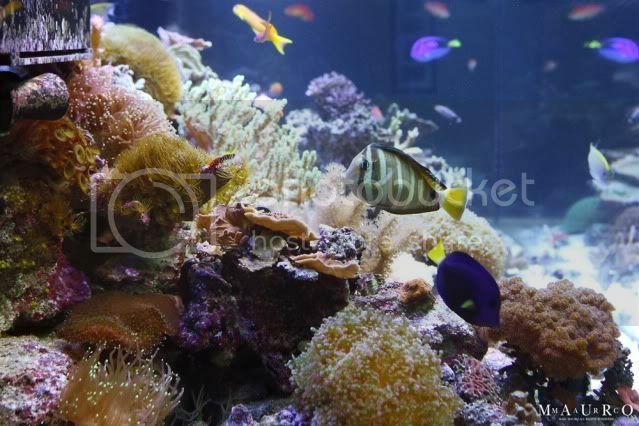 It takes a LOT of coral to make a 450g tank look like a full blown reef, what goodies do you have in there? And…various snails, crabs, along with Peppermint, Blood, Coral Banded shrimp, Serpent Stars, Cucumbers, and the now infamous Loc Ness Sea Hare. Your fish must really enjoy having 450 gallons of swimming space, so what do you have in there and does all that space make a difference? Is there anything else you have planned for your system? The tank is a work in process and I still need to empty and move the 200g 8’ sump to allow access to the rear of the tank…it is very hard to work on a 40” wide tank! 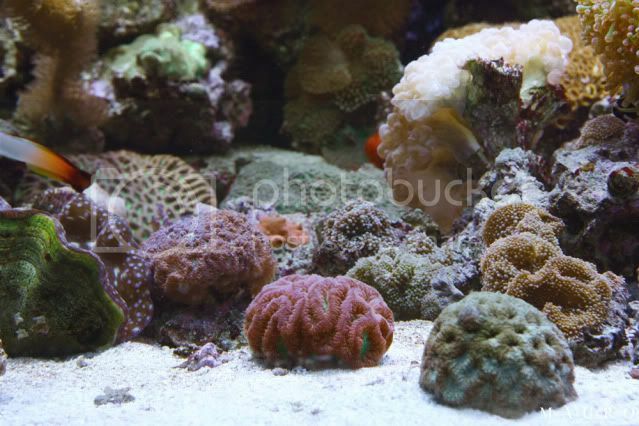 I may also have to remove some GSP, and other encrusting corals, which will be a major headache. Hopefully I will get this finished in the next few months, so I can dismantle the 300g QT system and ‘pretend’ that I’m done! For a while anyway! You have become a fixture on MR for about the last 3 years or so, where does a site like MR fit in for reefers? It's unfortunate that Josh was only about 10 years old, when I started reefing, because this site would have made things so much easier. The deals on the Marketplace alone, are reason enough, but the member's advice and knowledge not only saves $, but can literally save live(stock)! Before a 'noob' spends his first $1 on this hobby, he needs to spend time on this site. I also need to thank MR for my many new 'reefing' friends, not only in the tri-state area, but people minutes from my home, that I might never have met without this site! I know you are more the quiet type (yeah right..) but tell us how your really feel about being our January 2011 TOTM? Sorry, little joke…but, seriously...THANK YOU, VERY MUCH, it IS an Honor! Thanks for the tank MOM! Yeah Mom, we’re all with him on that!! Last edited by KathyC; 01-03-2011 at 02:56 AM..
Congratulations on tank of the month. Beautiful tank and amazing set-up you got there Alfie. Cheers to you. Awesome tank Alfie.... Keep up the good work. His epic tank makes me want to see how his QT tanks look like! nice tank, What is that one tang you have there, with the tannish body? 4 out of 3 people are bad at math. where I roam at will...."